Brace yourself: This game includes gratuitous fish kissing. 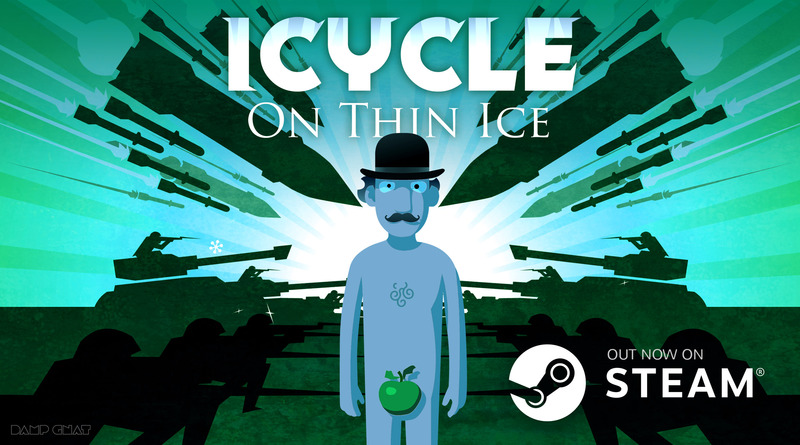 The award winning sequel to the classic platform puzzler browser game – Icycle (included) is coming to PC & Mac!Cycle naked over a deadly post-apocalyptic world with no enemies, no friends… and nobody to love. Experience the hostility of Earth frozen in time, dress and humiliate Dennis with pitiful garments, enter his lovelorn dreams on a shopping trolley with a lamp shade for a hat. After all… the last human on earth has lost everything and now he’s losing the plot. Available NOW on PC, Mac, iOS, AppleTV and Google Play. The first instalment of The Making of ‘Icycle: On Thin Ice’ is about The Naked Hook and its attractive repulsion. The second instalment of The Making of ‘Icycle: On Thin Ice’ takes a Look on the Bright Side in the face of the end of the world. The third instalment of The Making of ‘Icycle: On Thin Ice’ reveals some of the inspiration for the game levels and discusses how the tools play a major part in defining what you make. The fourth instalment of The Making of ‘Icycle: On Thin Ice’ reveals the origins of how Icycle came to be through various iterations and sources of inspiration. Sound Designer Andrew Jacobs of Stilton Studios describes the making of the sounds for Icycle on thin ice and shares his unusual but effective techniques. This was in fact a rolled up damp flannel smacked down onto the tiles – layered with a good healthy thump on a wooden desk. Sometimes things have great and fortuitous timing (but mainly not). At the same time as you needed collapsing building and rubble we had our patio doors put in by myself and father. This left a massive pile of rubble in the back garden. The final result was a mix of this last session and the brick and tile smashing from the garage. This is a mix of fake and real. I got hold of an industrial amount of icecubes ( like the ones you get in pubs) and poured them with Mr Jacobs Snr into a big plastic box, close mic-ed and other various takes from various distances. The fake element was dropping marbles into a glass vase with a tiny bit of water in the bottom. The final result is a mix of the two, particualy for the ice rewards. Treatment of these is usually filtering ( hi pass to knock out the un-needed bass) and plenty of compression to squash the dynamic range and make it sound upfront. The howling wind that features in both icycle games is very simple, but more of a foley style thing. I experimented with white noise from synthesisers and DAWS like the excellent and free program Audacity. But these seemed too static even if I filtered them by tweaking the cutoff and resonance. The end result which has got some much use is in fact my mouth blowing over the top of a pint glass while laying on the floor and making wind type noises. Had to be careful with mic placement as of course air/wind in microphones makes a terrible poppy noise fest. The end result is a mix of various takes, with copious amounts of reverb and hi pass filtering. I did wonder if I should add reverb as some of the action takes place outside ( not much reverb outside normally) But it just doesnt feel right without it. It just makes it more post-apocalyptic-y. The rolling boulder is mainly a massive piece of cylindrical steel about 4 inches in diameter rolled across a concrete floor and another take of it rolled across a wooden work bench. This is layered and has a few more of the same object from different takes, but slowed down. Slowing or speeding up sound is something I have always used and loved the texture of. Ever since I investigated the Beatles use of tape manipulation in songs like ‘rain’ where the drum track is played quickly and slowed to give that great grainy sound, I have been hooked. Not much tape in studios these days, but as I grew up mucking about with sound on a Tape based Portastudios I always favour the sound of ‘Repitched’ Pitch shifting, as opposed to the chop it up into slithers of sound and then glue it back togther which is more common in musical applications as this keeps the tempos of things the same. Its all about the texture baby! These are roland 808 drums and some percussion I have around like My cymbals. These are layered with the sound of a good heafty whack of a spring reverb unit on a guitar amp. Fortunately I dont yet have a mobility scooter. This sound was made with various layers of cordless power drill, one for the top end and a slowed down version for the low end, filtered and compressed as required. The reverse beeps are the sound of Audacity sine wave generator then cut off into pieces. Bicycle/car tyre pump, Garage door whack, air escaping – aerosol, squeeking door hinge, rolling log around floor, dropping bag of coins, shutting lounge door, bubbles in a glass. Another layered/loop. Centrifugal force with coins and marbles in a round plastic bowl, layered with keys and metal objects in another few takes. Some normal speed, some slowed. A trick here is masking tape pulled slowly out of a reel and slowed down sounds like cracking, that you might imagine on a wooden pirate ship/ galleon – mixed with slowed down door hinges.